Since the end of August my morning routine of waking up at 11 and leisurely sipping coffee has done a complete 180. Now, I wake up hours before I leave the house so I can be aware of current events and look presentable for class. 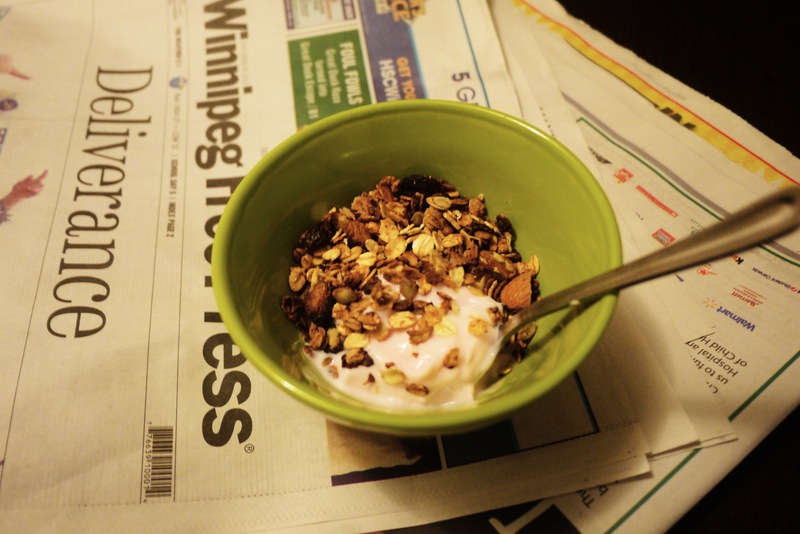 I’ve also become less inclined to make myself a decent breakfast, but that’s where granola comes in! It’s easy to do ahead and make a lot of, and it’s delicious over a big bowl of fruit and yogurt. The recipe I use is adapted from a recipe I found on The Daring Gourmet. The added hemp protein is from Manitoba Harvest, which has a wide variety of edible hemp products that are grown, and processed, in Manitoba. 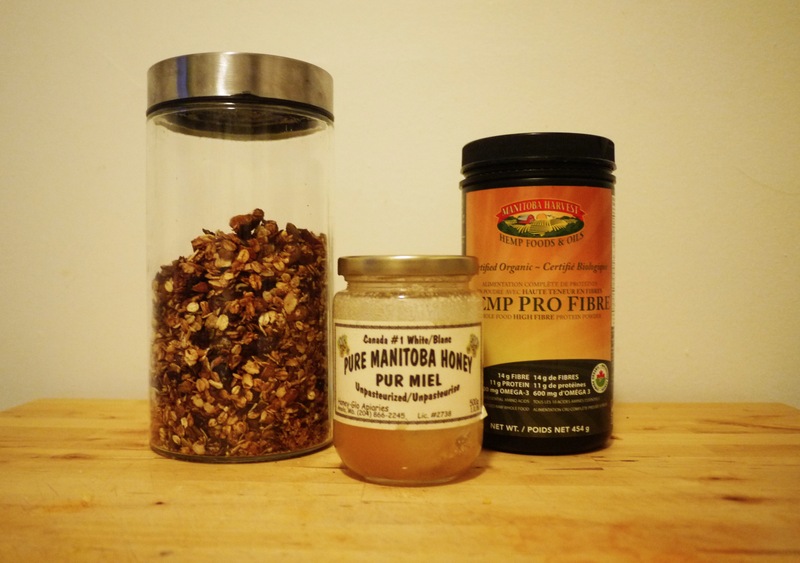 As well, the honey I used is from Honey-Glo Apiaries in Anola, MB, and can be found at either of the Tall Grass Bakery locations. Place the oats in a large mixing bowl. Add the coconut flakes, nuts and seeds and stir to combine. Place the honey and coconut oil in a small saucepan and bring to a boil. Boil for one minute and remove from heat. Pour honey mixture over the oat mixture and stir until coated. 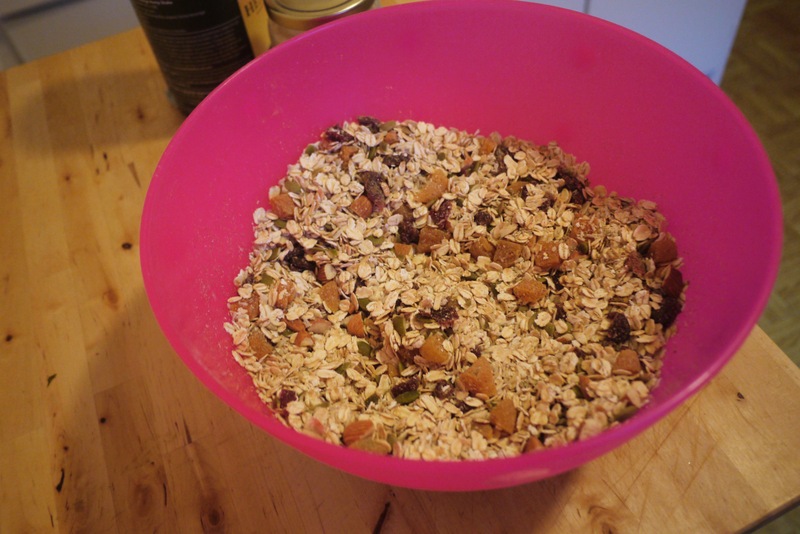 Let the granola cool completely then add the dried fruits and stir to combine. Store in an airtight container. Keeps for about a week. Watch your granola very carefully, I’ve burnt many a batch walking away for to long!